After making his way down from rural Alberta, Canada through Columbus, OH, Seth Frack has been happy to call Winston-Salem, NC home since the late-nineties. Shortly after moving south, he attended the University of the North Carolina School of the Arts where he received a Bachelor of Music degree in Trombone Performance under the instruction of James Miller of the LA Philharmonic. He continued on to a earn a Master of Music degree in Trombone Performance also under James Miller, and has remained an active performer in the state ever since. During the day, Seth works as Director of Software Development for a technology company. His orchestral trombone experience includes the North Carolina Symphony, the Chamber Orchestra of the Triangle, Opera Carolina, the New World Symphony, the Winston-Salem Symphony, and the Greensboro Symphony. He has also performed with the Carolina Brass, the Carolina Philharmonic Brass Quintet, the North Carolina Chamber Brass, the Giannini Brass Quintet, and the da Capo Brass Quintet. His jazz and salsa background includes the Charlotte Jazz Orchestra, Orquesta International La Clave, Tropic Orchestra, and the Piedmont Jazz Collective; as well as local jazz jams in the Triad area. 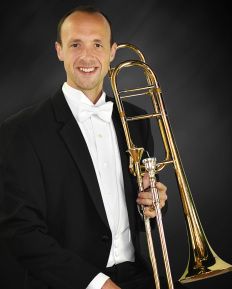 Seth currently serves as principal trombone of the Carolina Philharmonic Orchestra, the North Carolina Brass Band, and the Piedmont Wind Symphony; lead trombone in the Camel City Jazz Orchestra; and is a founding member of the Ardmore Brass Quintet.